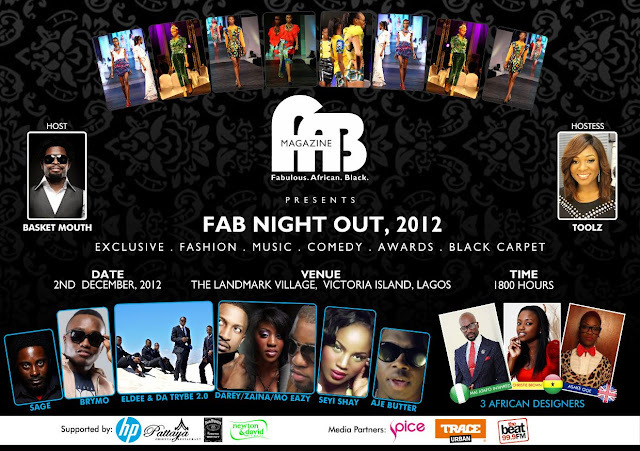 In less than a week, FAB Magazine will host another stylish evening of celebration with the third edition of FAB Night Out. Set to take place on Sunday 2nd December 2012 at Landmark Village in Victoria Island, Lagos, with black carpet starting at 6pm prompt, FAB Night Out 2012 will play host to a bevy of VIP guests from the world of business, fashion, entertainment and lifestyle. The night will see awards presented to winners of the public voted in 26 categories and 3 lifetime achievement awards as decided by FAB Magazine to be given to Fashion Icon of the Year, Fabulous African Business and Fabulous African Business Person. The stage will be set for some of the most celebrated names of Nigerian music who will be performing live on the night; eLDee and Da Trybe 2.0 including Aramide, Sojay and K9; Darey and the Soul Musik crew including MoEazy, SeyiShay and Zaina; Brymo from Chocolate City and AjeButter. On the runway showcasing their latest designs will be Nigeria's Mai Atafo Inspired with dapper menswear designs and Asake Oge from the UK with glam eveningwear, and lastly Ghana's Christie Brown showcasing creative African-inspired designs. Beyond fashion and entertainment, FAB Night Out will feature spoken word by Sage Hasson and a keynote address by author and change agent Adewale Ajadi. FAB Night Out 2012 is supported by Pattaya Oriental, Newton and David, Jack Daniels and Hewlett Packard. Two lucky winners on the night will get two brand new HP laptops as a FAB gift, courtesy of Hewlett Packard, Media partners for FAB Night Out 2012 are Trace Urban, Beat FM and Spice TV and the social media hashtag for the event is #FNO2012 Public voting which closes midnight on 30 November 2012 can be done online at http://fabmagazineonline.com/awards/ and event will be streamed live at http://fabmagazineonline.com/fab-tv/.